During cancer radiation therapy high-energy radiation is used to reduce tumour tissue. The irradiation produces a shower of secondary low-energy (<20 eV) electrons, which are able to damage DNA very efficiently by dissociative electron attachment. 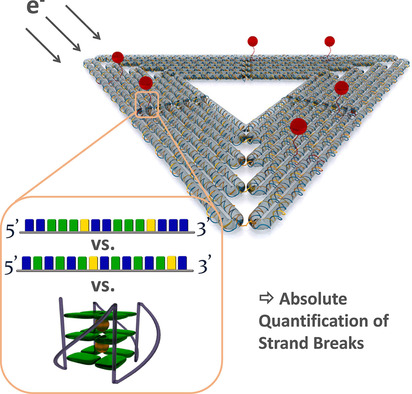 Recently, it was suggested that low-energy electron-induced DNA strand breaks strongly depend on the specific DNA sequence with a high sensitivity of G-rich sequences. Here, we use DNA origami platforms to expose G-rich telomere sequences to low-energy (8.8 eV) electrons to determine absolute cross sections for strand breakage and to study the influence of sequence modifications and topology of telomeric DNA on the strand breakage. We find that the telomeric DNA 5\'-(TTA GGG)2 is more sensitive to low-energy electrons than an intermixed sequence 5\'-(TGT GTG A)2 confirming the unique electronic properties resulting from G-stacking. With increasing length of the oligonucleotide (i.e., going from 5\'-(GGG ATT)2 to 5\'-(GGG ATT)4), both the variety of topology and the electron-induced strand break cross sections increase. Addition of K+ ions decreases the strand break cross section for all sequences that are able to fold G-quadruplexes or G-intermediates, whereas the strand break cross section for the intermixed sequence remains unchanged. These results indicate that telomeric DNA is rather sensitive towards low-energy electron-induced strand breakage suggesting significant telomere shortening that can also occur during cancer radiation therapy.